Rugby League World Cup 2013 celebrated the ‘one year to go’ mark today, Friday October 26 2012, with a truly international press conference. Players from all 14 competing nations were available to the press on the day that also marked the date that tickets for the tournament went on general sale. Nine players from across the globe, representing Australia, Cook Islands, Fiji, France, Italy, New Zealand, Papua New Guinea, Tonga and the USA answered questions from the media about their preparations for RLWC2013 via a specially created Google+ Hangout. Players from hosts England and Wales, as well as Ireland, Scotland and Samoa were present at the press conference in MediaCityUK, the home of RLWC2013. RLWC2013 General Manager, Sally Bolton said: “We wanted a special event to mark this very significant milestone for the tournament. The one year to go date was too good an opportunity to miss and gave us a great way to launch our tickets going on general sale. “Early ticket sales to the fans of the Rugby League clubs and those who pre-registered have been overwhelming. We’ve found that there is huge interest in the big games of the tournament, the opening double header at Cardiff and the semi-finals at Wembley in particular. “Sales for the Rugby League World Cup Final at Old Trafford however have really exceeded our expectations, currently out-stripping the other venues by five to one. I’d urge anyone therefore to buy tickets for the final now to avoid missing out. “We think that offering 55% of our tickets at £20 or less to see the best players in the world represents fantastic value. This is the pinnacle of Rugby League, a global sport which delivers extraordinary speed, power and athleticism to the spectator. 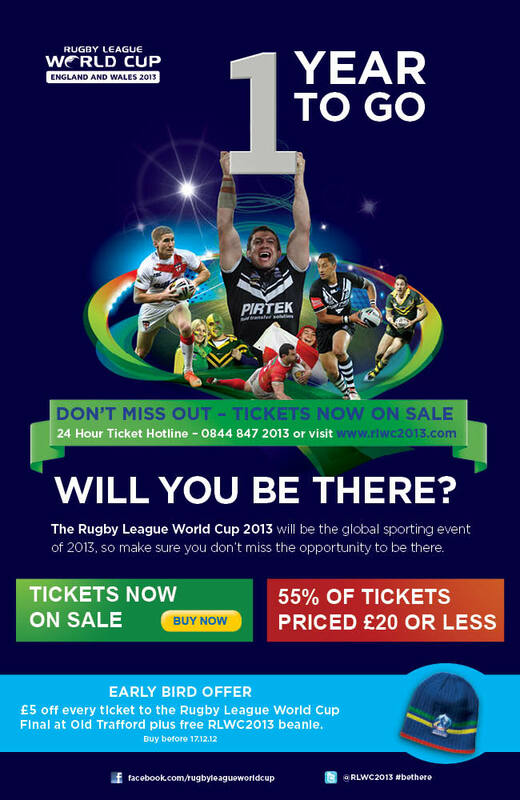 “To gather players from all of the nations who will ultimately be responsible for making RLWC2013 the best Rugby League World Cup ever was a great way for us to kick off ticket sales”. Two RLWC2013 games will be played in Leeds at Headingley Carnegie Stadium, the home of rugby league in the city. Reigning world champions New Zealand will take on Papua New Guinea on Friday 8 November and the first quarter final featuring the winners of Group B and Group C is on Friday 15 November 2013. Tickets are available from today (26 October 2012) from the ticket office at Headingley Carnegie Stadium and the Leeds Visitor Centre at Leeds Railway Station. Councillor Adam Ogilvie, Leeds City Council’s executive member for the 2013 Rugby League World Cup in Leeds said: “We are delighted that Leeds is hosting two high profile games during this fantastic tournament. 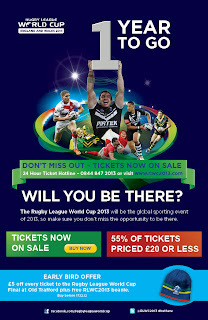 Tickets starting at just £10 (£5 concessions) for group games and quarter-finals are available for purchase for all games and via various special packages at www.rlwc2013.com. Leeds Visitor Centre is situated at Leeds Railway Station. Opening hours are Monday 10am - 5.30pm, Tuesday to Saturday 9am - 5.30pm, Sunday 10am - 4pm. For more information please visit the website www.visitleeds.co.uk, email tourinfo@leeds.gov.uk, or telephone 0113 242 5242. Rugby League World Cup 2013 kicks off on Saturday October 26, 2013 at the Millennium Stadium in Cardiff, with matches played in England, Wales, Ireland and France. The final on Saturday November 30, 2013 will be played at Old Trafford. The competition's structure will consist of two groups of four and two groups of three. England are drawn alongside arch-rivals Australia as well as Fiji and Ireland in Group A; Rugby League World Cup holders New Zealand will face Pacific Island rivals Papua New Guinea and Samoa along with France in Group B.
Scotland will face Tonga and Italy in Group C and joint hosts Wales have been drawn against the Cook Islands and the USA in Group D.